When I was a little girl, growing up in Montreal, my Mother would bake a delicious, old-fashioned pan cake for our family. This cake definitely falls into the comfort food category. The treat itself is a wonderfully tender and light vanilla sponge cake. 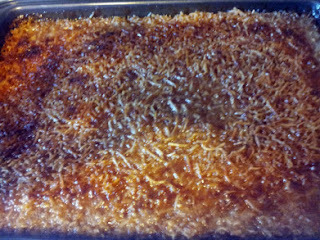 What sets it apart, is the lovely, crunchy, broiled caramel and coconut topping. 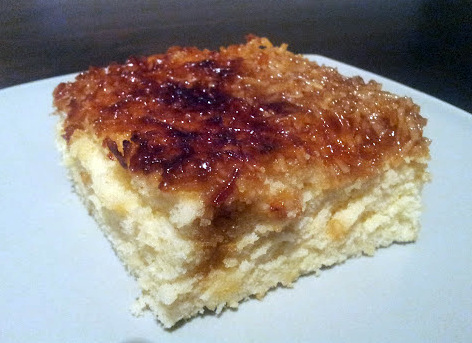 It has been awhile since I have thought of, or baked, this delectable cake, but something triggered my memory and I decided to whip it up for our Sunday family dinner. Let's just say, no one even dared to pick at the topping before it was served (wink), and everyone wanted seconds. This may not be the healthiest dessert, but I do believe "everything in moderation". So easy to prepare and always a favourite of those who have tasted it. I would love to hear your about your favourite comfort recipes... please do share. In a large bowl, beat eggs for 4 minutes with electric mixer on high. Add sugar and vanilla, continue beating until light and fluffy. Add flour mixture. Pour batter into 9x13 inch pan. 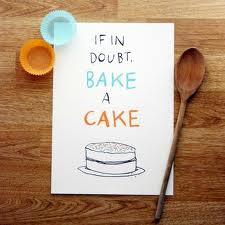 Bake at 350 degrees F (175 degrees C) for 40 min-60 minutes - * until a toothpick inserted into the cake comes out clean. To make the frosting: In a saucepan, combine brown sugar, coconut, 6 tablespoons butter and 4 tablespoons milk. Heat and stir until butter is melted and mixture is smooth. Pour over cake as soon as it comes out of the oven. Put cake in the oven under the broiler and bake 3 to 4 minutes, or until icing is light brown. *Do not walk away, it can go from perfect to burnt all too quickly.